Biochemistry is that branched of medical science which deal with the chemical processes within or related to living system. Human Biochemistry deal with the chemical process in the human being. It is one of the basic subject of medical science. Because without study biochemistry, you can understand pharmacology and histo-pathology. Fortunately there are many great book written on biochemistry like lippincott biochemistry ,harpers illustrated biochemistry, chaterjee biochemistry. These are also the standard. And used as textbook. But Satyanarayana Biochemistry is very simple and you can understand it easily. After studying Satyanarayana Biochemistry i was fell that this book is very necessary for the basic study. It very simple and easy to understand. Also it would consumed less time as compere to other book, And would be revised quickly and in much less time. You should download Satyanarayana Biochemistry from this page. But first let us tell you about the authors and the book by a quick review. 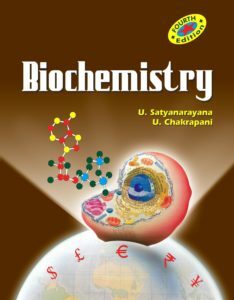 Authors of this biochemistry book is U. Satyanarayana and U. Chakrapani. Four editions of the book is published so far. New edition is completely revised and free from mistakes. It is used as textbook in Asian especially in India, Pakistan etc. And also one of the trusted and recommended book for biochemistry. Proper arrangement of topics, beautiful diagrams, figures and tables make it more easy to understand and learn biochemistry. Styanarayan biochemistry is one of the leading book used for biochemistry. Four editions of the book are published so far. It has one of best illustrations then other biochemistry books. From its figures and diagrams you can revised for exam in no time. New edition is updated with the advanced knowledge. And new topics is added about the latest discovery. You can download preview pdf version of satyanarayan biochem below.